Jupiter’s Europa –The Deepest Ocean in the Solar System? The deepest ocean on Earth is the Pacific Ocean's Marianas Trench, which reaches a depth of 6.8 miles awesomely trumped by the depth of the ocean on the Jupiter's moon, Europa, which some measurements put at 62 miles. Although Europa is covered in a thick crust of scarred and cross-hatched ice, measurements made by NASA's Galileo spacecraft and other probes strongly suggest that a liquid ocean lies beneath that surface. 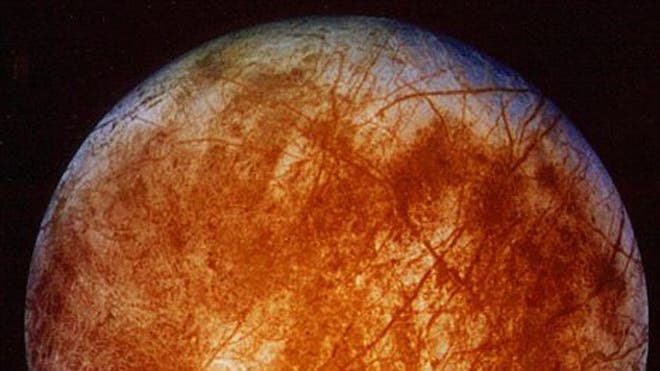 The interior is warmed, researchers believe, by the tidal stresses exerted on Europa by Jupiter and several other large moons, as well as by radioactivity. Most scientists believe that the subEuropan seas are locked under tens of kilometers of ice. Heat is then conducted from the warm core by bulk convective motion of ice – huge chunks of frozen material literally carrying the heat away with them as they move up through the icy layer, shuffling and refreezing as they dump heat into space. But Jupiter's Europa might not only sustain, but foster life, according to the research of University of Arizona's Richard Greenberg, a professor of planetary sciences and member of the Imaging Team for NASA's Galileo Jupiter-orbiter spacecraft. Europa, similar in size to Earth's moon, and has been imaged by the Galileo Jupiter-orbiter spacecraft. Its surface, a frozen crust of water, was previously thought to be tens of kilometers thick, denying the oceans below any exposure. The combination of tidal processes, warm waters and periodic surface exposure may be enough not only to warrant life, but also to encourage evolution. With Jupiter being the largest planet in the solar system, its tidal stresses on Europa create enough heat to keep the water on Europa in a liquid state. More than just water is needed to support life. Tides also play a role in providing for life. Ocean tides on Europa are much greater in size than Earth's with heights reaching 500 meters (more than 1,600 feet). Even the shape of the moon is stretched along the equator due to Jupiter's pull on the waters below the icy surface. The mixing of substances needed to support life is also driven by tides. Stable environments are also necessary for life to flourish. Europa, whose orbit around Jupiter is in-sync with its rotation, is able to keep the same face towards the gas giant for thousands of years. The ocean is interacting with the surface, according to Greenberg, and "there is a possible that extends from way below the surface to just above the crust." "The real key to life on Europa," Greenburg adds, "is the permeability of the ice crust. There is strong evidence that the ocean below the ice is connected to the surface through cracks and melting, at various times and places. As a result, the , if there is one, includes not just the liquid water ocean, but it extends through the ice up to the surface where there is access to oxidants, organic compounds, and light for photosynthesis. The physical setting provides a variety of potentially habitable and evolving niches. If there is life there, it would not necessarily be restricted to microorganisms." Tides have created the two types of surface features seen on Europa: cracks/ridges and chaotic areas, Greenberg said.The ridges are thought to be built over thousands of years by water seeping up the edges of cracks and refreezing to form higher and higher edges until the cracks close to form a new ridge. The chaotic areas are thought to be evidence of the melt-through necessary for exposure to the oceans. The tidal heat, created by internal friction, could be enough to melt the ice, along with undersea volcanoes – a combination of factors would give organisms a stable but changing environment — exactly the type that would encourage evolution. NASA and the European Space Agency are hard at work on a joint mission that may launch in 2020, and which will examine Jupiter, Europa, and another moon named Ganymede. A major objective is to determine the thickness of Europa's ice crust, which has implications for the moon's potential to sustain life.